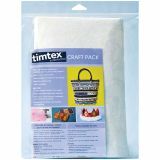 Timtex Craft Pack Interfacing - C&T PUBLISHING-Timtex Interfacing Craft Pack. Timtex is 100% polyester for consistent thickness and texture. Firm yet flexible interfacing it is perfect for shaping into purses, bowls and other three-dimensional craft projects. Easy to cut, mark and sew. Machine wash and dry. This package contains one 15x18 inch sheet and complete instructions for use and care. Imported.